Campaigners step up their lobbying for a nuclear-free Jordan as the final decision with regards to the chosen firm approaches. The Jordanian government will pick the firm which will build Jordan’s first nuclear station in May. Greenpeace campaigners in Jordan have urged the government to consider “the dire risks” the proposed nuclear project will have on current and future generations. “Nuclear reactors can never be safe. That is the reality,” said Safa’ Jayoussi, Greenpeace Climate and Energy Campaigner in Jordan. “It is time the government takes seriously our proposition for an energy policy based on renewables.” Greenpeace have issued a report entitled ‘The Future of Energy in Jordan’ illustrating the vast potential for renewable energy in the form of wind and solar energy. The report states that Jordan’s lack of nuclear expertise alongside serious challenges such as a lack of cooling water, existing grid weakness and seismic concerns, make the proposed nuclear project a real threat to Jordanians. Renewable energy resources – particularly solar, however – can technically provide sixty times more than Jordan’s electricity consumption in 2050. 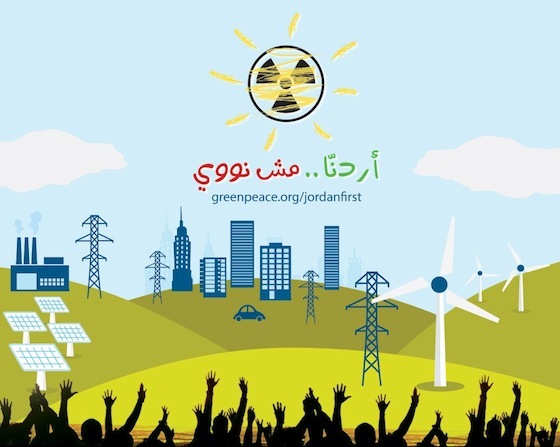 Greenpeace asserts that a vision for a nuclear free Jordan is possible, and a bold vision for 100% renewable is in fact attainable by 2050 and will contribute significantly to the local economy with the creation of more than one hundred thousand direct and indirect jobs, and a saving of over $19 billion (on a present value basis) by 2050.More than 20 million Jordanian Dinars being spent over the past five years on the nuclear power program. Greenpeace calls on the Jordanian Prime Minister to listen to the people and issue a decision to stop the proposed nuclear program. To sign the Greenpeace anti-nuclear petition, visit their website. They currently have over 5,000 signatories.